Happy Anniversary Trip Chowdhry... or something like that. Last year -- March 20, 2014 to be exact -- Mr. Chowdhry, then a managing director at Global Equities Research, was quoted providing perhaps the worst analyst call on Apple (NASDAQ:AAPL) ever. They only have 60 days left to either come up with something or they will disappear. It will take years for Apple's $130 billion in cash to vanish, but it will become an irrelevant company ... it will become a zombie, if they don't come up with an iWatch. Apple's first post-Jobs product is an extremely inspiring story, and wearable technology is an exciting and developing field. In the end, wearable technology could be bigger than smartphones -- but not yet. Right now, the iPhone is Apple's core business, and Cupertino is executing well. There are many analyst estimates for projected Apple Watch sales, but the consensus is its iPhone line will continue to be the revenue driver long-term, regardless of the company's watch business -- unless Mr. Chowdhry assumes the smartwatch will replace iPhone demand (see below). In order for Apple to become a "zombie," the company would have to experience a huge decrease in demand for its core smartphone business. While Mr. Chowdhry doesn't specifically say this, he points toward the smartwatch as a substitute or a replacement for the smartphone. It isn't. For example, the current No. 1 smartwatch -- Samsung's Android Wear -- needs an Android-based phone for full functionality, making the product complementary, not substitutive. Unless Mr. Chowdhry expects iOS users to abandon the iPhone for Samsung over the lack of a watch -- and considering Samsung sold only 1.2 million units last year, that's unlikely -- this is a fundamental misunderstanding of the relationship between the smartphone and the smartwatch. Essentially, this is akin to saying printers will replace laptops. For long-term investors, the best advice is also the simplest: buy quality companies -- or an index -- and hold for as long as possible. The problem with that is it tends to produce poor copy. In addition, there's a perverse incentive for analysts to be overly aggressive with recommendations in an environment where correct calls are remembered forever while incorrect ones are quickly forgotten. Until Motley Fool founder David Gardner's dream of Moneyballing the financial world comes true, this incentive will persist. For long-term shareholders of Apple that ignored Mr. Chowdhry's advice, congrats, you're sitting on an additional 70% gain. 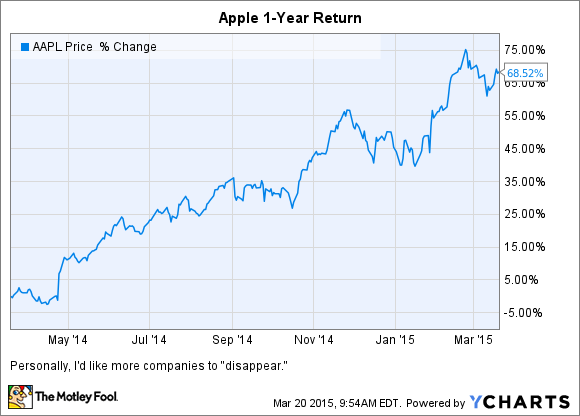 If Apple is a "zombie" company, remind me to search for more investing opportunities among the undead.